Online exclusive: Kicking off this week’s guide to holiday gifts, Theresa Orlando joins us from Female Musician.com. 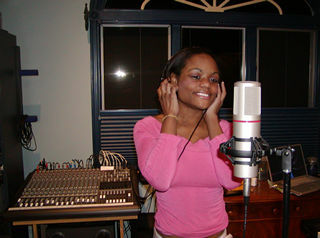 Theresa’s site and studio help young female musicians like vocalist Ashley Jewdy (shown) hone their craft and digital studio skills. Theresa brings us some of her favorite picks for musicians, including a book/video on breathing technique for singers, music lessons in Long Island, an inexpensive mic duo, mutable guitar cables that prevent pops and squeals, and iTunes music. “Breathe, breathe in the air, don’t be afraid to care”, said the 1973 Pink Floyd lyric, when Dark Side of The Moon was THE vinyl to have beneath the turntable needle. Well, today it’s Nancy Zi who’s making a living on breathing and encouraging us all to join the deep breathing craze, in a new art form she calls CHI YI. As a professional opera singer, Nancy provides this book for peak vocal performance, stress reduction, and everyday well-being. Encourage your girlfriend, spouse, or child’s desire to shine! Now through January 31, 2006, FM Digital Studio in Northport (Long Island), New York is offering one lesson free with the purchase of a music lesson gift package ($105.00 OR $210.00) Singing, piano, keyboards, and recording sessions/make a CD, available as gift package. Call: +1 631 754 0479, email fm@femalemusician.com, or order via the Female Musician Digital Studio Website. Audio-Technica (AT2041SP) hits home with this unbelievably-priced combo pack containing two condenser mics. The AT2020 records lush vocals and handles a wide range of instruments; the AT2021 small-diaphragm condenser is designed for direct instrument recording including acoustic guitars, drum overheads, pianos, and group vocals. 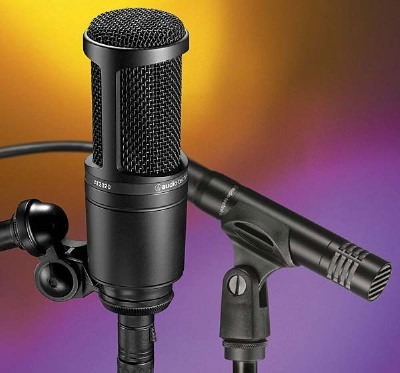 Together, the two mics can handle a wide variety of recording tasks. The package includes a pivoting stand mount and mic clip. A real sweet choice for compact digital studios, leaving ears and wallets just tingling all over! The Planet Waves’ Circuit Breaker™ cables have a built-in mute switch to save equipment from loud pops and squeals, making on-stage or in studio guitar/bass changes a snap. 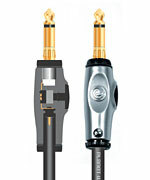 Once the cable is shorted, remove the cable from the guitar being used and plug the cable into the next instrument. Press the button again to re-activate the cable signal. Try bizrate.com for best price. If your friend or loved one has an iPod, the gift certificate, music card, or allowance options available at iTunes.com will feed the need for more tunes. Apple makes purchasing these cards easy by using emails and codes. Purchase at iTunes.com or a nearby Apple Store. MERRY CHRISTMAS & HAVE A HAPPY HOLIDAY SEASON! Theresa Orlando is founder and editor of The Female Musician, and producer and host of the She Grooves Radio Hour, which can be heard on Long Island at 6pm Wednesdays on 88.9 FM WCVF-FM (SUNY Fredonia) or via podcast.